Finding that perfect unique engagement ring is one of the most nerve racking and difficult things to do. Due to an ever growing difficulty, we are here to help. Many jewelry stores advertise unique rings. But, are they really “unique” if that exact style is being advertised to everyone? The only way to ensure you get a genuinely unique ring, is to design your own custom engagement rings. However, designing the perfect ring can be tricky. Follow our “do’s and don’ts” when designing a personalized engagement ring for the best custom engagement rings Sugar House has to offer. Always check to make sure your diamond is GIA (Gemological Institute of America) Certified. Based on the four C’s of choosing a quality diamond (Cut, Clarity, Color and Carat), GIA certification ensures that your diamond choice has been researched and graded accurately. This will ensure that your personalized engagement ring will shine just as bright on your sweethearts finger as it does in the bright lights of the store. Choose a unique diamond cut that works well with your band and setting style. Sometimes we can pick out the most beautiful band, and a beautiful diamond. However, that diamond set on that particular band could end up looking clunky and unnatural. Therefore it is important to research styles and cuts that fit well together for a creative engagement ring. If you are designing a custom engagement ring for a significant other, be sure to get their input and approval. You may be making these decisions without your sweetheart there to tell you exactly what she likes. If this is the case try bringing one of her close friends or family members. Take written notes about things she has told you she likes about rings she has seen. Chances are she has been dropping a lot of hints or saving a lot of Pinterest posts. Design a custom band that allows light to enter the diamond. 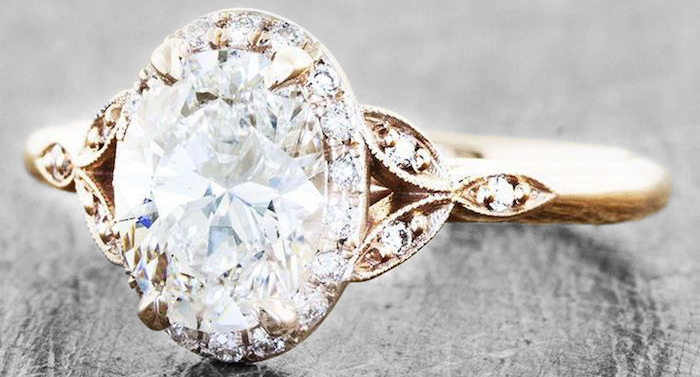 You can still create a nontraditional engagement ring without ruining the setting. Open up your diamond setting at the bottom to allow your diamond to “breathe”. Allowing a diamond to breathe means to allow light to enter the base of the diamond causing it to give you the best possible sparkle. If you close your setting at the bottom and on the sides, even the most perfect diamond will look dim and dull. Don’t over do it. There is possibly nothing worse than a cluttered, over the top engagement ring. Elegance and simplicity often go hand in hand. That being said, it is more than okay for you to explore unique ideas and extravagant ring designs. A few of our favorite modern examples can be found at LaBijouterie. Don’t try to make your ring into an image. Often, unusual engagement rings are very sought after. That being said it sounds like turning your ring into a picture of a diamond clad pony would be a great idea… It’s not. You are far better off creating a simple, unique and beautiful ring design of your own. Don’t give in to the tacky advertisements. There are too many ads out there telling you about their “beautiful chocolate diamonds” or multicolored diamonds. Usually this means they aren’t selling very many of that particular diamond; and for good reason. If we have said it once we have said it a thousand times for the perfect ring, it is best to err on the side of simplicity and natural elegance. Many readers are thinking they can’t afford a custom ring right now. You can! There are great custom rings for all budgets. You probably have an idea of what the perfect ring would look like in your head, yet you still haven’t been able to find it in a store. Take a simple drawing or concept to a consultation, and we will turn it into a reality. contact us for a consultation now so we can get started with your custom engagement ring.